These replacement Door and Quarter Panels are for the 1969 Chevy Camaro Coupe models. Manufactured to factory specifications and workmanship. Door and quarter panels use quality, durable material to make the interior new looking and stand up to the elements. There are 3 styles of 1969 Door Panels, the Silver Series, Gold Series and the Concours Series. Silver Series are a durable economical replacement panel with fiber backed pleats that are Heat Seamed to achieve their look. The Gold series differ in that they use molded material under the vinyl to achieve a sharper, OE beveled appearance. The Concours Series is essentially the Gold Series door but comes pre-assembled and ready to install out of the box. All series use Durable Masonite wood backing, NOT Cardboard. They stand up to rain and cleaning to keep them looking new longer. All door panels feature period specific Madrid grain vinyl and correct colors and pleating patterns for the given year. Only the Concours comes pre-assembled and contains accessory items such as the OE steel door-top, lock grommets, stainless steel trim, badges, and beltline weatherstripping. 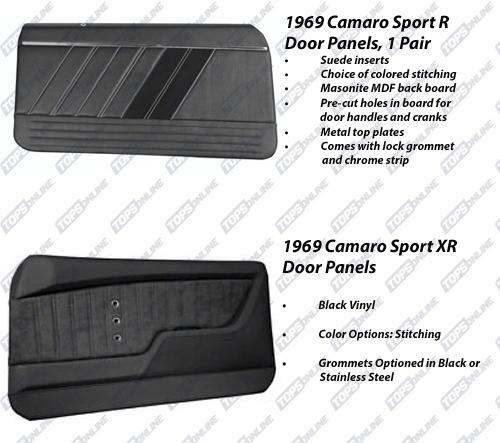 These aftermarket Sport R and Sport XR Door Panels are designed to make your 1969 Camaro look great, with an updated, modern interior. Although they are not factory style, they will fit your Camaro exactly like factory door panels. Both Styles are the Complete Panel Assembly, Top Rails included, Bright Trim and Lock Grommets Included. There are 3 styles of 1969 Quarter Panels, the Silver, Gold and Concours Series. Silver Series are a durable economical replacement panel with fiber backed pleats that are Heat Seamed to achieve their look. 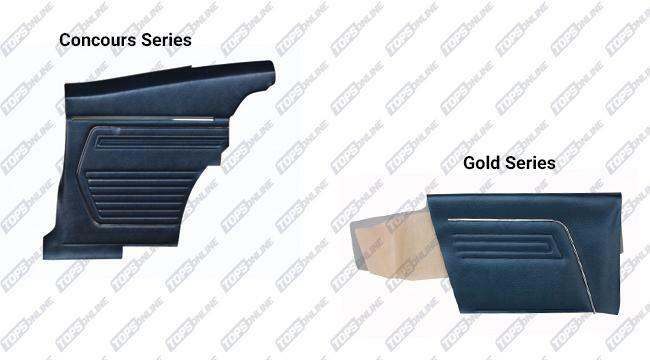 The OE Gold series differ in that they use molded material under the vinyl to achieve a sharper, OE beveled appearance. 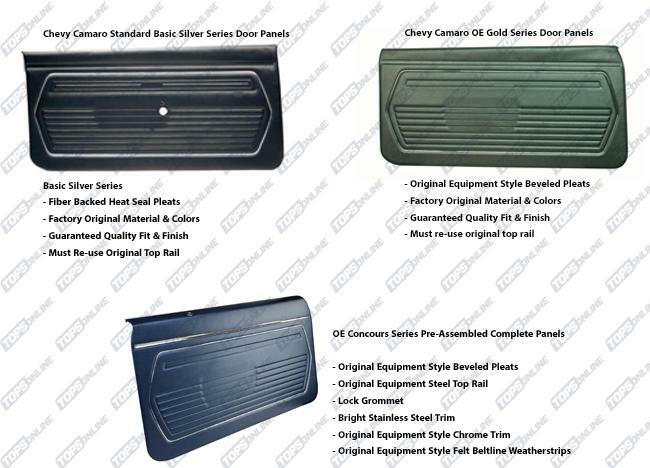 The OE Concours series is a Pre-Assembled Complete Quarter Panel with all the features of the OE Gold series. It includes the OE Steel top rail, Lock Grommet, Bright Stainless Steel Trim, OE Style Chrome Trim and OE Style Felt Beltline Weatherstrips. All quarter panels feature period specific Madrid grain vinyl and correct colors and pleating patterns for the given year. Guaranteed Quality Fit & Finish. These aftermarket Sport R and Sport XR Quarter Panels are designed to make your 1969 Camaro look great, with an updated, modern interior. 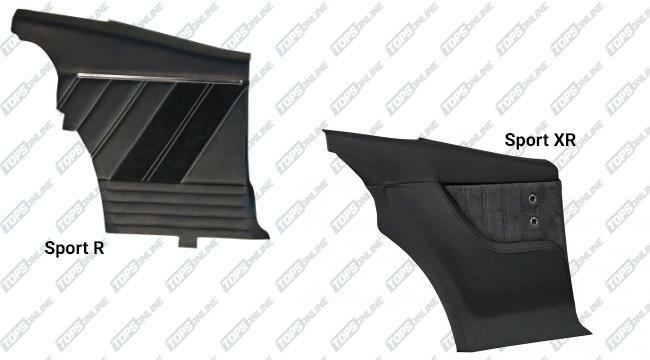 Although they are not factory style, they will fit your Camaro exactly like factory quarter panels.